NOTE: The details and information pertaining to California gun and ammo laws are meant as a reference point only. As you're likely aware, California firearm laws change frequently so be sure to talk to an attorney or consult your local law enforcement agency before making any final firearms related decisions. There are a number of laws pertaining to firearms ownership and buying ammo in California, making it one of the most difficult states for gun owners in the nation. Generally, you can buy ammo in California if you are over 21 years old and are legally eligible to purchase and/or own a firearm. Armor piercing rounds are generally not legal in California and state law will not allow the purchase of 50 BMG ammunition. Additionally, there are restrictions on magazines that do not allow you to buy magazines larger than 10 rounds. Of course, all federal laws also apply in the Golden State. All ammunition must be shipped to a Licensed Ammo Vendor in the state. We've built a network of ammo vendors willing to do transfers to our customers and integrated it into our checkout. These ammo vendors are likely to charge a transfer fee (typically $15-$20). Lucky Gunner is able to ship ammo directly to Type 3 FFL Holders (Curious & Relics). However, these FFLs are only allowed to legally "import" ammunition to California for personal use. If your vendor is not on the approved list, we will need a copy of their license and a completed copy of this transfer agreement. 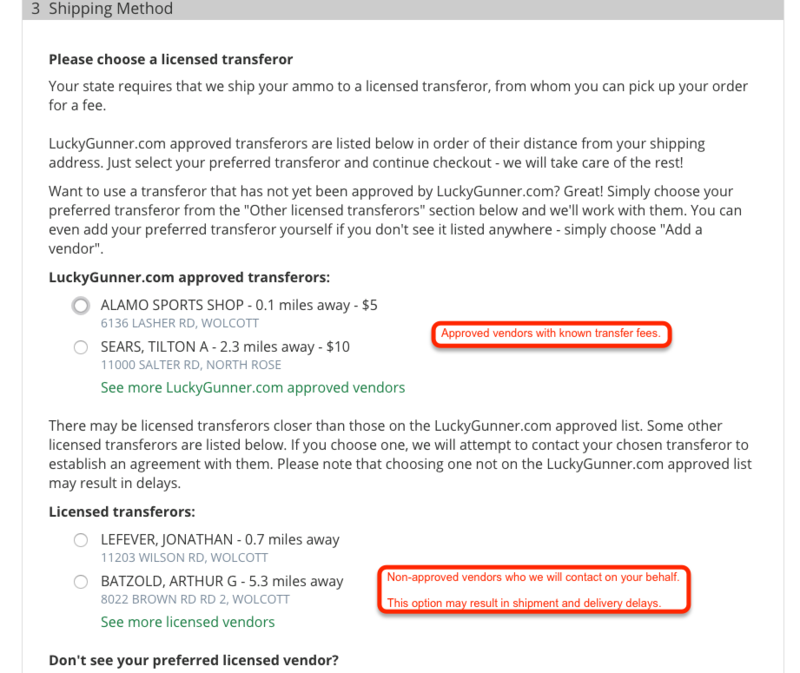 The above link includes a place to upload the license and submit the transfer fee information. Once the vendor has completed those tasks, they’ll be added to our approved list for easy processing in the future for other customers as well so you’ll be doing all Californians a big favor. If you chose an approved vendor or once we have approved your chosen vendor, it is time to ship out your order. We will send your package tracking information the evening that the package ships so that you can track the package to the vendor of your choosing. We also send an automatic email to your chosen vendor informing them of the coming shipment and also providing them with the tracking number and your phone number and email. We do this so that they can contact you in the event there is an issue or early arrival of the package. Please plan to pick up your shipment as quickly as possible from when it arrives at the transferring dealer's location so that you can notify us if there are any issues. Shipping to California from Lucky Gunner generally takes about 5 business days depending upon your proximity to a major metro area. Rural residents may have a slightly longer wait as UPS and FedEx transit times are typically longer the farther from a metro area you live. Check out this run-down on all the CCW laws in California, broken down by municipality. Here's a list of all of the FFL dealers in California, sorted by location. Here's a current list of the representatives from California to the U.S. House of Representatives and U.S. Senate. These people vote on federal judges who directly impact your 2A rights and can play a huge role on our rights as a community of sport shooters and gun owners! Check out this tool to locate shooting ranges in California. Sort by distance from a particular zip code or by a list of amenities.